At UNILAD it always kind of feels like there’s an apocalypse around the corner and thank your Hollywood stars this one’s coming in a cinematic way. 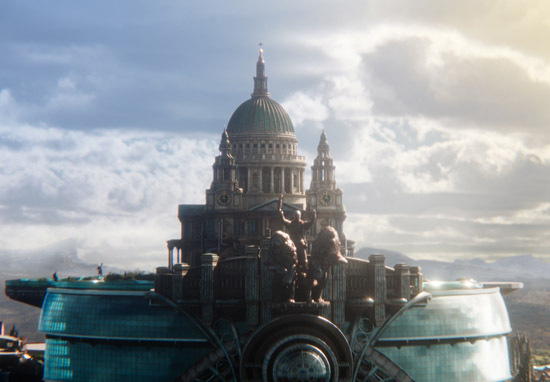 And we’re not venturing too far from Blighty because we’re talking about Mortal Engines, the steampunk-like adventure based on the novel by Philip Reeve, produced by Peter Jackson and directed by Christian Rivers, where motorised cannibalistic cities prey on each other in a dystopian world. It’s poised to be the next Hunger Games opening up an existence that feels creepily close to home when viewed from the edge of your seat. Earlier this week we dusted off our goggles and got exclusive access to chat to cinematic visionary Peter Jackson and Christian Rivers on his feature-length directorial debut about their exciting new release. UNILAD: Peter, it was first announced that you were working on the adaptation of Mortal Engines back in 2009, is that right? Why was it in development for so long? Peter: Yeah, at least! I think we got the rights to the books a year or two earlier than that, even. We were just schoolboys then, eh Christian? It was a long time ago. Christian was doing previz – previsualisation – on it back in 2008, 2009, and then The Hobbit came along. And, you know, it took five years to make those three movies. Christian directed a lot of the second unit stuff on The Hobbit, so we managed to keep him busy during that time. Once The Hobbit was finished, we swung our focus back onto this. You know, we had to write the script, which took a while, and do a lot of pre-production, but if there’s anything to blame it’s the three Hobbit films that got in the way. But we certainly had every intention of eventually making this. It’s such a great story. UNILAD: You’ve put together an all-star cast – how difficult was it for you to find your Tom and your Hester? Christian: It was quite tough, actually. They were both quite late casting choices, we cast hundreds of people, hundreds of wonderful young actors for those roles and then we just zeroed on Robbie [Sheehan] and Hera [Hilmar]. Obviously, they’re a lot older than the Tom and Hester of the books, which was a conscious decision that we wanted to do. We didn’t want it to be a YA/kids’ movie about a teenage love story, we wanted them to be young adults. And you know Robbie just has a natural charm and wit and an affableness about him that’s what Tom needed, and Hera has a wonderful sort of humanity – and the ability to guard it, and be feral and strong and dangerous. So yeah, I mean, we were just lucky that we ended up with the perfect casting really. UNILAD: In the books, Hester has a much more prominent scar than we’ve seen so far in the trailers – was there a reason that was changed? Peter: Yeah, you know, what we wanted to achieve in the story is… you’ve got to realise a book is very different to a film, because in a book you have a description in text and it’s up to the reader how much you want to imagine in your mind what she might be like. And certainly, you’re right, Reeve describes her in that way, but on film it turns out to be a far more graphic thing.And for us, we wanted our reaction to Hester to be very much like Tom’s reaction, so when he first encounters her, she has that scar – and she does have a very prominent scar, there’s no doubt about that – he can’t get past the scar. She’s a dangerous assassin with a huge scar on her face! But as the story goes along, and he falls in love with her and she with him, we gradually forget the scar. And it’s exactly the same at the end of the film as it is at the beginning, but we wanted the audience to be able to get so used to it that they didn’t think about it any more, just the same as Tom’s journey. So it was a balance. If you go too much then you’re always going to be distracted by it; every shot of her, you’re going to be thinking about the scar and not the story, so there’s a definite reason why it’s not exactly verbatim as described in the books. UNILAD: The Sixty Minute War, and the Traction Era, and the steampunk world that Philip Reeve conceived is an amazing setting for a story. How did you go about taking it from the page to the big screen? Christian: We wanted to make a very real world and we didn’t want it to sort of rest on being steampunk. So we looked at a lot of different genres that were set in the future, and that had futuristic elements to them, or science fiction elements, all trying to keep in mind Philip’s wonderful world that he built – we took all these examples of where not to tread, to create something new. We were in untouched territory. Steampunk is very reliant on a sort of Victoriana and steam engines and it’s a world of its own, and ours isn’t. The Sixty Minute War happens in our future, we’re not jumping off from the Victorian era, so we needed to create a future where that does have sort of slightly retro aesthetic to it in areas, but also has highly futuristic aspects to it. Peter: We approached it not as a steam world but as an analogue world, so the only rule we made for ourselves was ‘no digital tech’. There’s no microchips, there’s no digital tech; they haven’t got factories that can make these silicon chips any more. That’s a science that’s been lost to them, but they have taken the analogue world way further than we did. They’ve had to resort back to the analogue tech that our world used to be, but you’re going forward 2,000 years, so what would the analogue world be like in 2,000 years’ time? That was really the frame of reference that we took. UNILAD: The traction cities themselves look amazing – was it difficult to visualise those? They’re so huge, how do you figure out how to bring that outlandish design to life? Christian: It was difficult, but that’s a design process you have to go through, and it all starts from the script. It is a story about these wonderful characters set in this world – and the setting of cities chasing other cities is merely the world they’re in. It’s the backdrop. But we wanted the world to feel real, and so it became a complex design exercise really of balancing the amount of industrial infrastructure these giant engines and cities would have to have the means to move around, and then also layering onto that the architecture, and essentially a city that people would want to live in. It’s a design exercise, really, that takes a long time. UNILAD: Just from what we’ve seen, London’s instantly recognisable because you can pick out those landmarks. Were there any London landmarks you wanted to include in the design that didn’t make the cut? Peter: That’s a good question. I don’t think so, no. What was fun was taking things like – obviously in the story, St Paul’s Cathedral is a major location, and it sits atop the traction city of London. And obviously, if you look at St Paul’s Cathedral today, it’s 400, 500 years old and it’s in pretty good shape, but because we’re going forward a couple of thousand years, we were envisioning what St Paul’s Cathedral would look like if it was more weathered and beaten up, like a Roman ruin or a Greek ruin – like the Acropolis or the Colosseum – it’s still St Paul’s Cathedral, but it’s 2,000 years in the future. And it’s on a city that’s moving, so it has a lot of wind and dust that’s hitting it, so it’s eroded away. Part of the fun of it was, not just familiar landmarks, but making them feel ancient. That’s the approach that we took. UNILAD: Most of the action takes place in London, but will we see any other traction cities in the film? I know Manchester shows up later in the books? Peter: Well, London’s the biggest one in terms of the story but there are a lot of smaller towns that are scooting about that we see, for sure. But this is the biggest predator city that we see in this particular story. But as you say, in the future books there’s a whole lot more. Mortal Engines growls in cinemas on December 14.